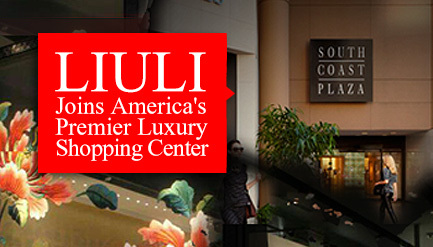 With nearly a decade in the planning, world-renown LIULI now sets foot in South Coast Plaza. At 10:00 this morning the brand opened the doors to its first art gallery in the luxury shopping center, located on the 2nd floor of Sears Wing. Among other notable artworks exhibited is museum-collected piece, Chrysanthemum Dance. In the past decade, LIULI has risen rapidly to global recognition. The brand’s art has been collected by New York’s Corning Museum of Glass, Orange County’s Bowers Museum of Cultural Art and London’s Victoria & Albert Museum. LIULI has exhibited in over 30 countries and has also received awards including iF design and German Red Dot. Aside from LIULI artworks, the gallery also features jewelry and lifestyle collections—embodying the spirit and aesthetic of the brand’s art into daily life. And now, in displaying its full colors at the West Coast’s most respected shopping center, LIULI continues spreading a love for art and culture. LIULI specializes in handcrafted crystal glass artwork in pate-de-verre (or lost-wax casting) that embodies Chinese culture and heritage. Founded in 1987 by artists Loretta Yang and Chang Yi, the brand has received multiple awards including iF Design and German Red Dot. LIULI artworks have been collected by institutions including Corning, Victoria & Albert, and Bowers.